One of the amazing things I woke up to this week was being nominated for the Liebster Award by the lovely Jamie (nice name, by the way) of Voluntown Housewife. It’s amazingly cool to be recognized in the blogging community especially as my blog is so young. I can’t wait to pass it on, but more on that later. Part of the nomination also includes a getting-to-know-you questionnaire. Read on for my little interview. 1. Where is your favorite place to travel? From the moment I touched the shoreline from the ferry, I knew I was in love with Scotland. After meeting a few hilarious people and touring the absolutely breathtaking Scottish Highlands, I was sold. I’m currently in the market for a Scottish castle complete with faerie mounds and magical waterfalls. Send me your realtor. 2. What is something on your bucket list? I’m constantly updating my bucket list. One of my bigger goals that I hope to accomplish soon is to hike the Inca Trail to Macchu Picchu. My main objective to convince my best friend, Sara, to come on board with me and perhaps go next year as a graduation celebration. If anyone has done this and knows of a good tour operator that will give us a safe and authentic experience let me know in the comments below. 3. What’s your favorite restaurant? It’s really hard to choose just one as I am always on the hunt to try someplace new. However, there’s been one constant restaurant all my life and even spans before my time. Mandarin Deli is an absolutely bomb place to get all my favorites: juicy dumplings, crispy onion pancakes, and the best beef noodle soup you can find in the Los Angeles area. I promise. I love this place so much, if you’re in the area and need a tour guide let me know and I’ll be there to show you the ropes. 4. What is your favorite family memory? When I was younger my family and I went on a Wild Wild West steam train tour to the Grand Canyon. Our train was held up by some robbing cowboys, one of which sat down next to my little sister much to her trepidation and offered her a few bullet shells as a consolation. I still have those shells on a shelf at home and love the memory of eating “canpakes” (my mom was reading Dreamcatcher by Stephen King at the time) for breakfast in a cabin in the Arizona desert. 5. Do you work out of the house or are you at home? Currently unemployed, I work exclusively on the blog from my home. I’ve tried bringing the laptop to a coffee shop for new ambiance, but I’m way too easily distracted to get much accomplished in an environment like that. I love people watching, so unless I’m writing fiction and can incorporate the characters I see into my writing it’s not a great workplace for me. 6. What are your holiday traditions? Man, the only holiday tradition that’s coming to mind is giving each of our dogs their own stocking filled with bones and new toys. Yes, our dogs may be a little spoiled. 7. Do you having a blogging goal you are looking to reach? If so what is it? Aha you caught me! One of my biggest, long-term blogging goals is to go on a sponsored trip. Whether it comes directly from the hotel or airline itself, or if Travel Channel falls in love with me and wants me to be the female Anthony Bourdain/ Andrew Zimmern I don’t mind. But hey, baby steps first. For now, I’m just hoping to get a loyal readership. 9. Are you working on a project? What is it? I actually have a few projects going on right now. November 1st isn’t just the start of my “Holy crap the year is ending” freakout, but also more widely recognized is that it’s the beginning of NaNoWriMo. If you’re not familiar it’s the goal of writing a 50,000 word novel in the month of November. I’m altering my rules slightly to make up for keeping blogging in my life. I’m also in the disorganized process of packing up my house to move out. Which also means I’m on my own special version of Chopped every day as I try to figure out how to combine the leftover foods in the house to make my meals. Hah! And this week I’m dogsitting my parent’s gorgeous, but aggressive spaniel, Harry (Prince Harry of Porter is his official title). I’ve made it my mission to Cesar Milan the anger management/ fear out of him. 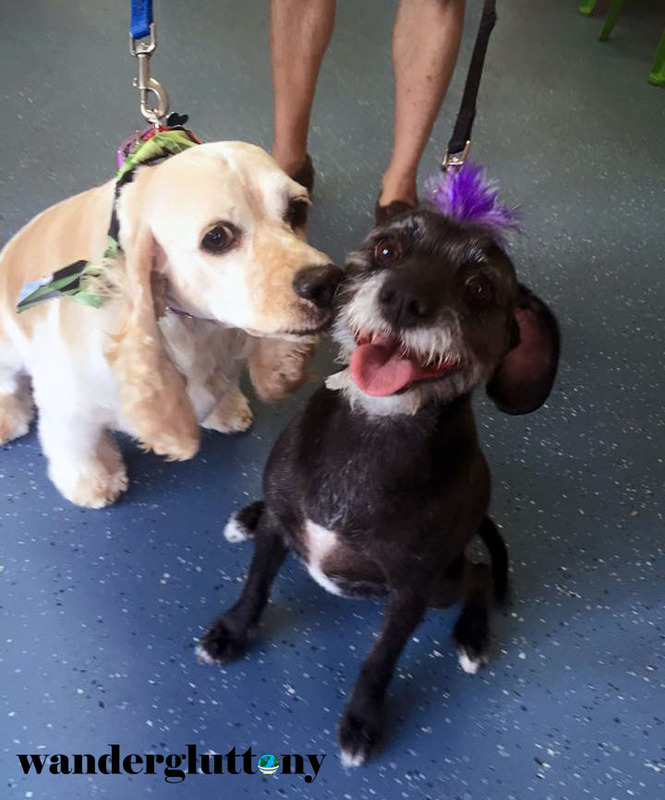 I’m open to tips from anyone to make your dog more dog friendly! Let me know in the comments. Like I mentioned earlier, part of this nomination is to pass it forward. 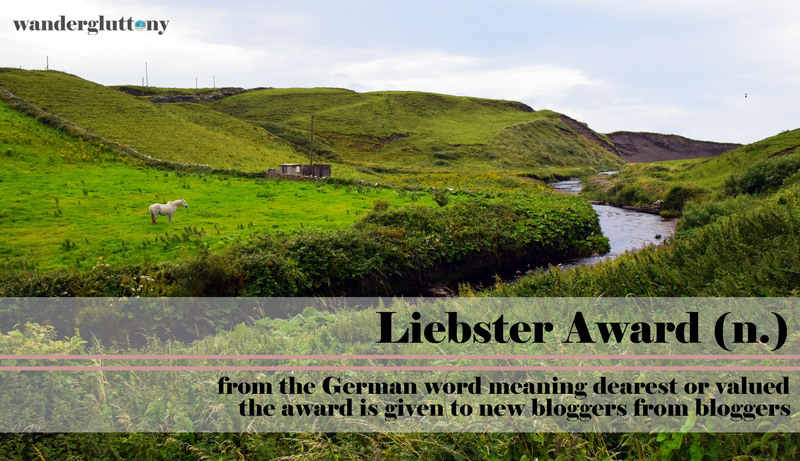 The Liebster Award is given by bloggers to other bloggers who you think deserve a little recognition. This award was made for readers to discover new blogs to fall in love with, so check out some of the nominees below! What’s your favorite TV show to marathon to? I have a good friend who just hiked Macchu Piccho! I will get some details from her and get back to you! She had an awesome time!! Awesome! You’re the best thank you! 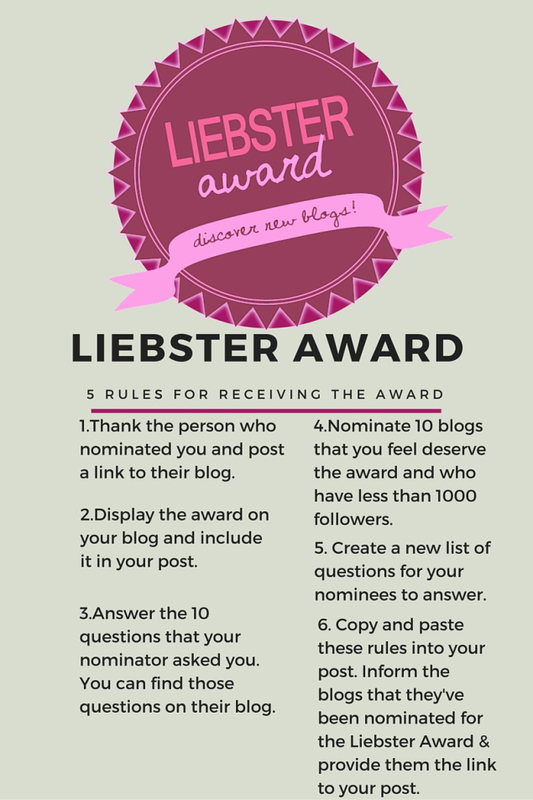 Love, love, love the Liebster award gives you an extra boost and inspiration when you are starting out!! I enjoyed my first Liebster award! Agreed! It’s such a great feeling to put stuff out there and feel like you’re being noticed!